Alfred Adey (Service No 348) was born in Bulli, NSW. He had served in the Cadets and CMF. At the time of enlistment he was a single 20 year old school teacher. He embarked on HMAT A19 Afric with C Company, 1st Battalion on 18th October 1914. 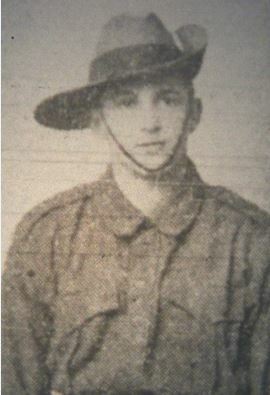 After training in Egypt he sailed for Gallipoli and landed on the 25th April 1915. At about 4pm that afternoon Alfred was hit in the feet by shrapnel. Indian troops near by dragged him to a sheltered gully and he was able to get himself to the beach where he was evacuated to hospital for treatment. He returned to the front but was wounded a second time. On 6th June he received a gun shot wound to his hand and was again evacuated to hospital for treatment before being transferred to England. Alfred was attatched to HQ London for the rest of the war. On 14th July 1918 he married Florence Cooper in London. Alfred was discharged from the AIF on 17th March 1919 in London, medically unfit. He returned to Australia in July 1921 with his wife and baby daughter.